iderdider....: siri, take our picture. We skipped church a few weeks ago and hit the beach. I really, really wanted a family picture. I wanted to remember this day watching them making castles and running in the frigid water and eating sand and just being together. 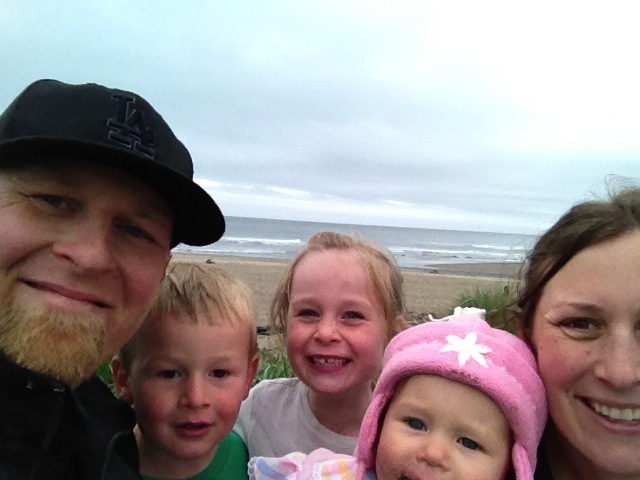 This is the best shot we got, the rest of them involved a squirming baby with a goatee of sand. I read a blog in which a woman said that her husband was so beautiful it sometimes hurt to look at him. I love my husband, but I can't say that I relate. And I'm going to guess that Nate manages to look at me just fine. But these three? This life. Holy cow. Such beauty. Sometimes I look at my life I can't believe that I ended up here. Everett frequently tells me that he wants to stay little. I always tell him that's fine with me. I had to read this twice before I understood the title and then I laughed out loud! I caught Ollie yesterday with my Mom's phone yelling at it "read me the bible". It was pretty funny.